Image Cropping and Resizing like other post photo editing operations are done to meet specific objectives. These are also executed by employing powerful software programs. Both cropping and resizing result in size reduction of the original photograph. However, the similarity ends there. Technically, cropping is a clipping operation generally inclusive. Of course, it can be done by the exclusive clipping also, decision being based on the circumstances. Resizing does not involve any removal of any portion of the photo. It is literally shrinking the size of the photo. Cropping, as mentioned earlier, causes a reduction in the size of the original photo. When on is doing cropping operation decisions have to be taken what is expendable and what needs to be kept. The operation is basically same as cutting a passport sized photo down to a size that is small enough to fit into one’s wallet. The important features of the photo are not lost. One cuts off the border which is not vital. Similar is the situation when a cropping operation is done. You decide what portions can be dropped and what is to be retained. 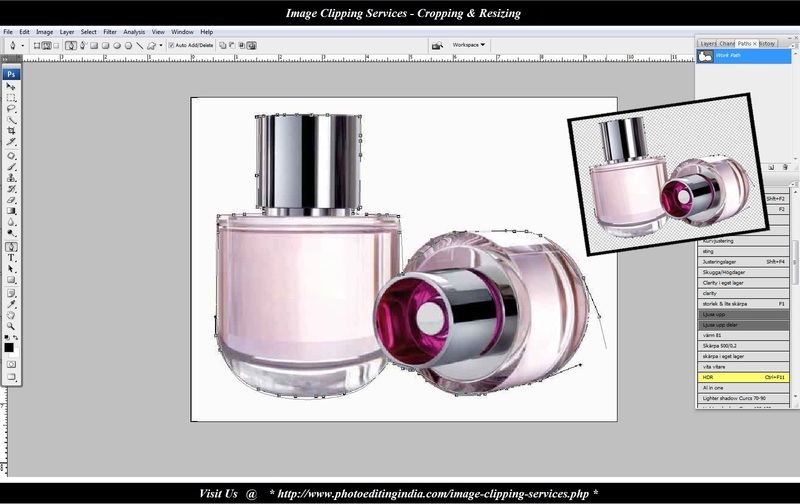 Then draw an inclusive clipping path around that portion that is to be retained within the limitations of the size. It may be relevant to state here that a clipping path is a vector path. The direction in which the path is drawn decides what is removed and what is excluded. Convention has what is drawn anti clockwise is inclusive and is drawn clockwise is exclusive. So, a path is drawn around the features that are to be retained, and the clipping operation completed. This will, essentially, give us a photo of required size with all the features intact just as in the original photo with the same resolution as the original. In other words the size reduction is achieved by simply removing what is considered superfluous under the circumstances. No details of the original are sacrificed at the altar of size. Resizing is an operation where the original photograph is shrunk in size. The size reduction is achieved not by eliminating, what under the circumstance can be considered as superfluous; there is nothing, as a matter of fact, considered as superfluous. The actual process consists of reducing the number of pixels per a unit area. This, certainly, results in a reduction in size but it is achieved at the cost of clarity. The resized photo would not be having all the details of the original. In actual practice both the operations may be resorted to as demanded by the situation. Resizing is employed when a photo is to be transmitted over the web. The photo may be too big to be accommodated in the smaller screen of a mobile phone, a PC monitor, or laptop. Needless to say all these operations are executed with the help of computer programs. This needs a very high quality infrastructure of hard and software and also well trained, skilled and experienced manpower that have long experience in the respective fields. In other words, if these operations are to be done to exacting quality and delivery schedules one needs the services of well qualified service providers’ .One such Photo Clipping Service Provider is the well reputed PHOTO EDITING INDIA. They have well-appointed infrastructure both of hard and software. Their technicians are all well experienced, well trained and skilled with artistic bend of mind. Needless to say this results in high quality products within the agreed time schedule. This results in great cost savings too.